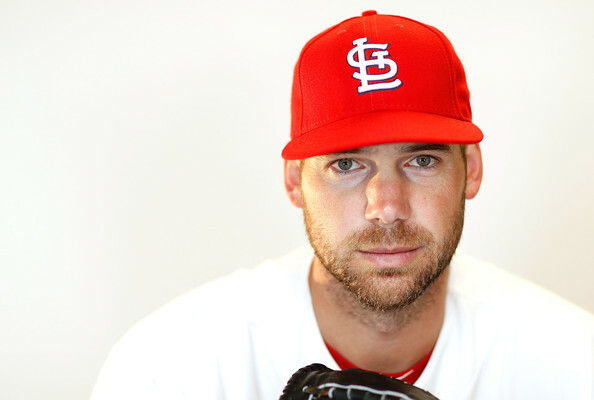 As Chris Carpenter wakes up this morning in Dallas minus a rib (ouch) and begins his recovery from successful neurologic thoracic outlet surgery, we of course wish him the very best. A recovery of 2-3 months was prescribed, allowing Carpenter to carry out a normal off-season program, barring complications. “The doctor is very confident that he should be able to pitch again,” said general manager John Mozeliak, who exchanged text messages with Carpenter following Thursday’s surgery. And, perhaps it’s only me missing him, but things just aren’t the same without him taking the mound every five days or so. 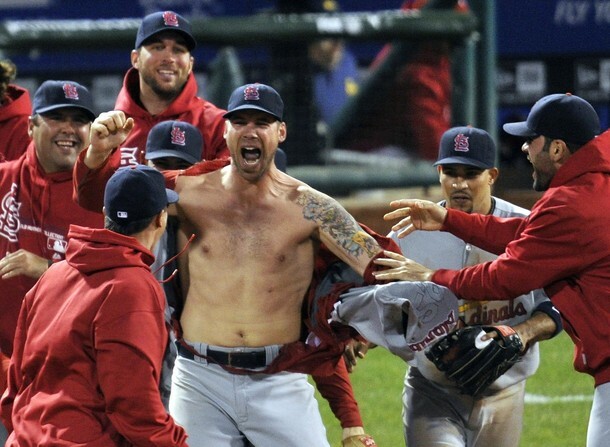 To help alleviate that, here’s a look at five of Chris Carpenter’s best games. What else could top the list? Game Five of the National League Division Series, Chris Carpenter vs. Roy Halladay — and CC throws a three-hit shutout that the Cardinals win 1-0 to continue along their charmed road that ultimately ended with a World Series championship. Tense, dramatic, yet there’s Chris smiling after getting Ryan Howard to fly out on 3-0 pitch in the seventh inning. Here’s a look at the highlights of his performance (though it unfortunately does not include Nick Punto’s shredding job that led to this. The picture will have to suffice). UPDATE: We now have video! Thank you, Michael. It was Labor Day, my first trip to Miller Park in Milwaukee and my first time seeing Chris Carpenter pitch in person. And all he did was throw a one-hit shutout as the Cardinals won 3-0. The hit was a fifth-inning double by Jody Gerut, so there wasn’t a lot of suspense about a no-hitter. CC struck out 10, and you can see many of those here. (Warning: seeing his curve ball on that video will make you miss him even more.) The win was CC’s 11th straight. I found my scorecard from the game, in which I jotted down his number of pitches a couple of times: 58 through five innings, 80 through seven and 99 total. However, I did not finish scoring the ninth inning — a lead-off walk to pinch-hitter Craig Counsell is where it ends. Either I was too nervous or too excited to continue. Also of note from my scorecard is how I listed the Cardinals, with first names for some and last names for others: Skip, Rick, Albert, Holliday, Ludwick, Glaus, Yadi, Ryan, Carpenter. (Why I listed CC by his last name, who knows?) In addition, World Series Champion Corey Patterson played center led off for the Brewers that day. Yes, Game 162. It was a must-win for the Cardinals on what ended up a magical night of baseball all around. In such situations, aces do what aces do. And CC delivered, as we all remember — a two-hit shutout with 11 K’s that ended up being, according to Al Hrabosky at the start of this video, his first victory in Houston since 2005. Then he and the Cardinals went back into the clubhouse and waited for the Phillies to beat the Braves, while we all watched TV and waited anxiously. So brilliant, he made it through eight innings on just 82 pitches. So brilliant, he faced 26 hitters and ran a three-ball count on, well, none of them. Heck, he only made it past ball one to nine of them. Average number of pitches he threw per Tigers plate appearance: An unbelievable 3.15. That’s how brilliant. It didn’t seem to matter if the Tigers went up there hacking or went up there trying to show a little patience for a change. Carpenter threw first-pitch strikes to 15 hitters — and nine of them were looking. And once he got ahead, those Tigers hitters could have been standing there with a bat, a jai alai cesta or a No. 2 pencil. Same difference. They were going down. The only mystery was how. Best wishes, Chris, and we all hope to see you back out pitching next season!